Kirknewton Community Development Trust wants you (and people in Kirknewton you know) to share your hobbies, skills, ideas and let us know if you would like to start a new club or help current village clubs, organisations and projects to help achieve the Kirknewton 3 Year Development Plan. 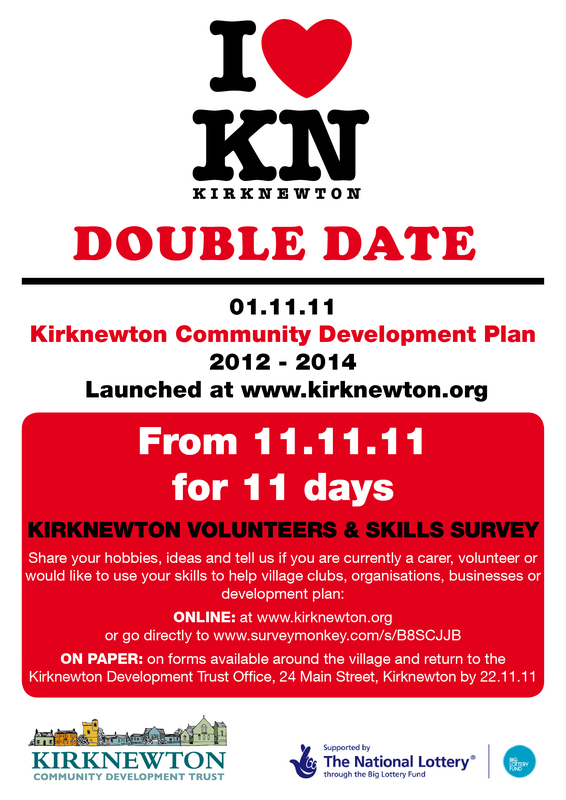 To do this you can fill out the Kirknewton Volunteers & Skills Survey online at http://www.surveymonkey.com/s/B8SCJJB or fill our the paper copy of the survey that either came through your door or is available from various outlets in the village. You can do this from today and it will continue from 11.11.11 for 11 days. Please fill out the survey as this will give us an idea how many people currently volunteer and what skills we have in the village. The survey should take less than 5 minutes of your time to complete. If you do not volunteer in the village or know of anyone who is looking for something new to do please encourage them to fill out the survey so we can help them to match their skills to current or new projects in the village (feel free to forward this message). We are particularly keen to hear from these members of the community.